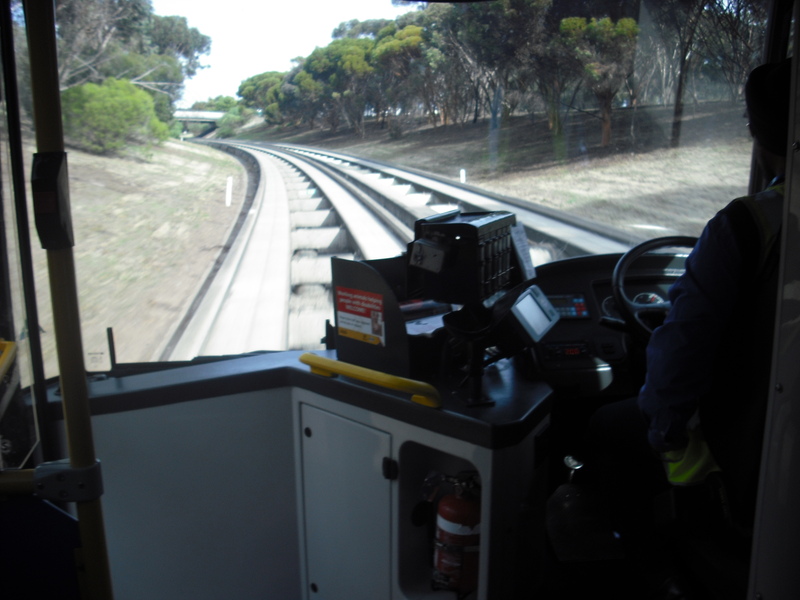 Adelaide’s O-Bahn runs on concrete tracks – very fast! The sculptor shows us a wonderfully serious-but-charming face. 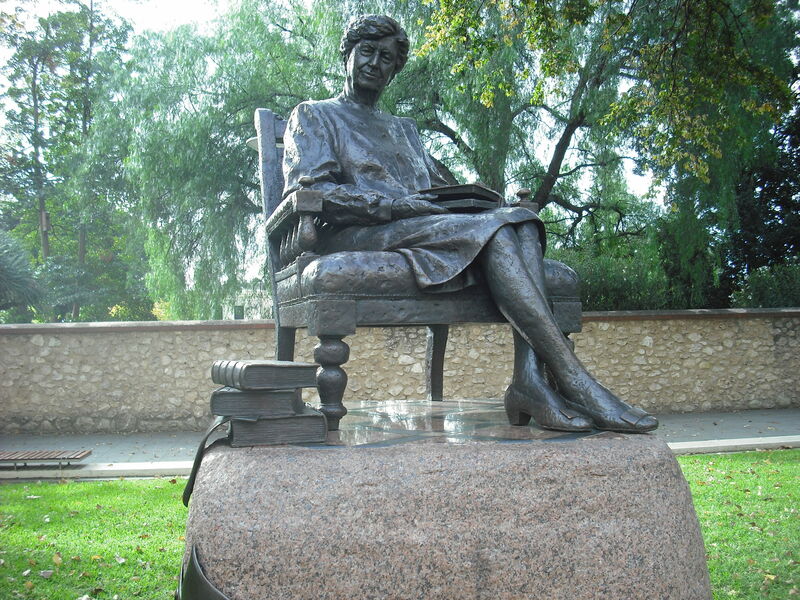 She has just gone to first place on my fantasy dinner party list – and perhaps I should invite the sculptor as well. I met with Annabel and her friend in the Art Gallery coffee shop for – of course – afternoon tea. 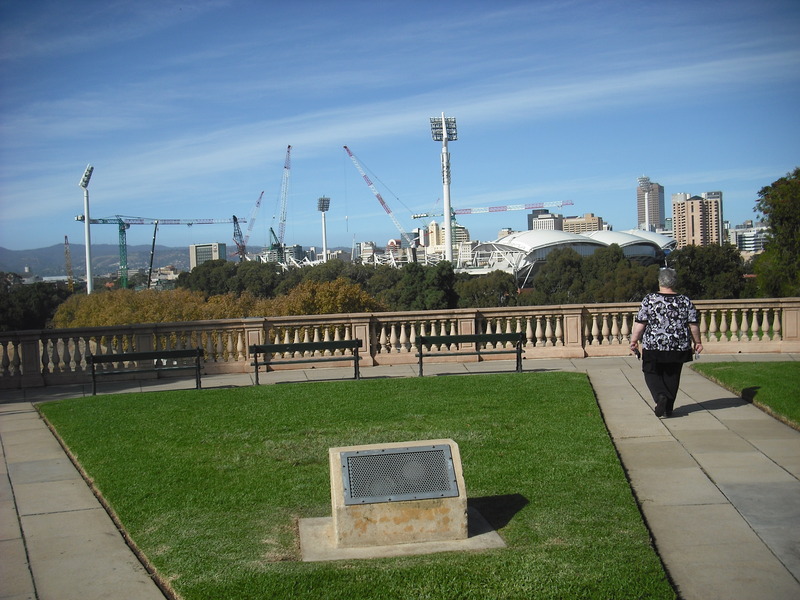 Perhaps this post should really be called ‘Eating my way around Adelaide’. Then – a rush to find and meet Val and get to the airport in time for our flight. Dusk was starting to fall. Time was starting to matter. Marvellously organised as always, Annabel had a bus route map, and knew all about the buses. (We had been to the thoughtfully-located Metro info shop earlier, where a good-natured lad who looked about twelve had been informative and patient with us.) 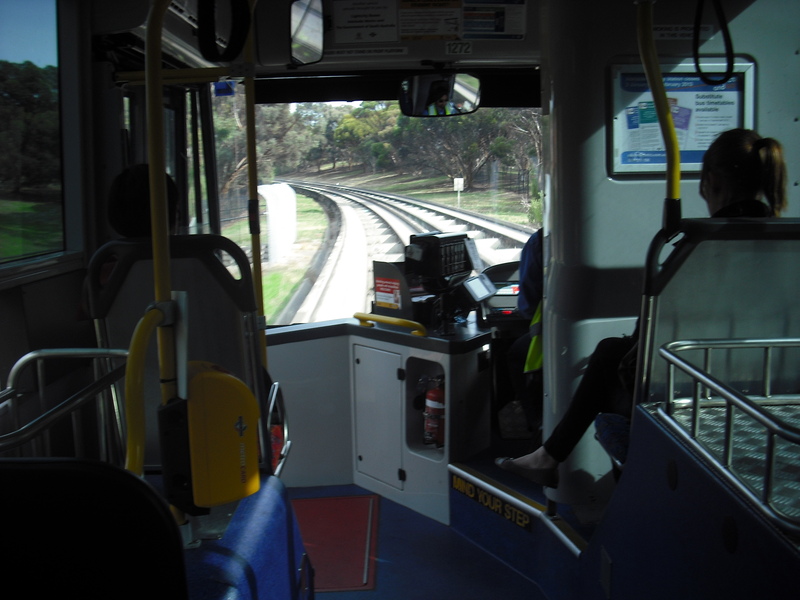 As I said – the number 170 bus route runs along North Terrace and then through the centre of town. Traffic lights, busy roads, interesting buildings, parks, (where to get off? where to get off?) There would be a sharp left bend then a right. Watch for it! Count the stops! Yes – this is it, and there’s Val in the distance, waiting already. Whew – made it. We jumped off near Hill Street, Parkside. Two paces later, and something is missing. A blast of knowledge strikes – something missing! Damn! left my raincoat on the bus – the bus – just pulled away. Or in the cafe? asks Annabel. That first urge is to run after the bus shouting and waving: I would have done it once, but now the stronger reaction is to shrug and let it go. Anyway, maybe it’s in the cafe. How humiliating! I feel like a child – and rather a stupid child at that. I’m not even that sure where I left it. 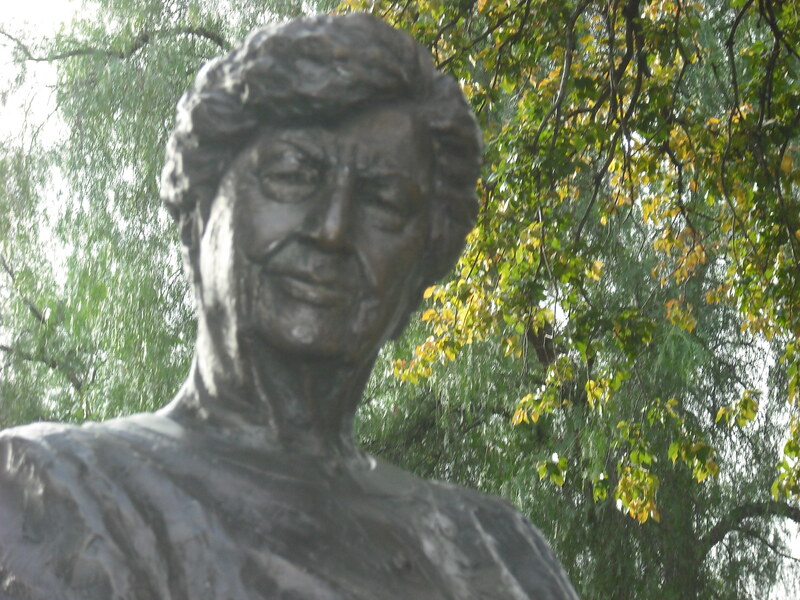 Annabel, however, is not one to let go, and back in Canberra is where the real kindness of Adelaide shows itself. Nudged by Annabel, I am to phone the Art Gallery and the bus station. The Bus Station number is easy to find – it’s on the bus route map that Annabel has saved. (I threw my copy away – needless to say.) A kindly woman at the other end is completely non-judgmental, and takes details of my raincoat as carefully as if it had been a work of art. (It’s black; crumpled tissues and a water bottle in the pockets; has a word on it – Berg-something – I tell her feebly). She will check with the depot and get back to me. Art Gallery Information are sweet – I have to phone their Security people (she puts me through), who haven’t seen it, but explain that when something is left in the cafe it can take a while, and perhaps I could ask them (he puts me through). The cafe staff are lovely – someone takes the time to go and check, finding that it’s not there. I feel happy as a sandboy – maybe I can fix things so that I spend the rest of my life phoning the lovely people who hold down busy jobs in Adelaide. Only a few minutes later and the phone rings. It’s the Bus Station lady – warm and personable – they have found my raincoat. I can feel her smiling over the phone, almost as pleased as I am that the raincoat is found. The word on it is ‘Berghaus’, she tells me kindly, as if she has known me for years. But alas they don’t post things to people – it will have to be collected from the depot – and she gives me the coat’s ID number, the address. I thank her and write it down, as I quietly give up again. I know no-one in Adelaide. No one at all. In the night I wake and think up plans to try to find someone online – maybe gumtree? Next day I email a few mates, to see if anyone else has a friend there – but no. (Val’s friend is elderly, so I don’t suggest her.) Annabel comes back from work, puzzling over the same thing, but she turns out to be willing to ask her friend (the one we met for afternoon tea – keep up!) for this favour. First though we check the map to find Newton (? – from memory) – where the Bus Depot is – and get some sense of the dimensions of the favour she will be asking. It’s a fair step out of town, but we ask anyway. Needless to say, this perfect stranger, her Adelaide friend, is willing to do it. Collect, parcel up, and post back to me care of my brother in Brisbane. What does she get in exchange, I wonder? A stranger’s gratitude, re-imbursement (but how can I value her kindness and trouble), a sense of being part of the community of those who do good deeds. This entry was posted on May 17, 2013 at 2:59 am and is filed under Australia and NZ, journeys. You can follow any responses to this entry through the RSS 2.0 feed. You can leave a response, or trackback from your own site.